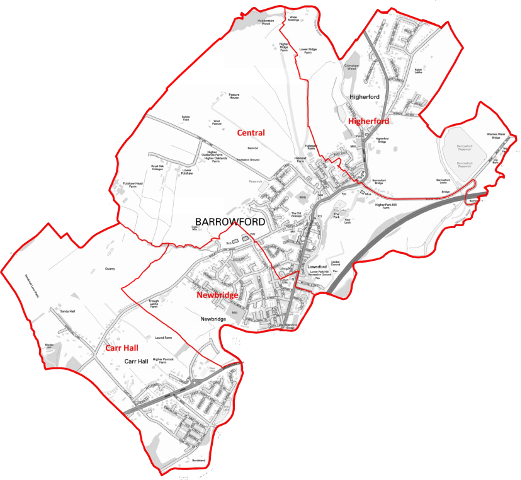 Barrowford Parish Council is made up of 12 councillors, elected every 4 years, representing the four Wards of Carr Hall, Newbridge, Central and Higherford. Set up in 1988, it represents the village to Pendle Council, Lancashire County Council and other bodies; manages allotments; and provides a number of other services. Here is everything you need to know about the Council, including contact details, meeting dates, important documents, news and events. We also include a guide to who does what in local government, including a full list of the Parish Council's activities and a full history of the Council. A further section, This is Barrowford, gives more general information on the village which we hope will be interesting for villagers and visitors alike. Please feel free to download our "Exploring Barrowford" booklet, or you can pick up a hard-copy version at many outlets in the village.